Diet pills have been around for a long time. Their goal, of course, is to help people who want to lose weight and become healthier. One diet pill that offers to help people who are obese and have possible health risks is Phentermine. Phentermine suppresses the appetite and is meant to be used for a small length of time. Short-term use, along with dietary changes, exercise, and changing behavior, has been shown to help many people with the weight loss they have wanted for so long. With Phentermine mainly affecting the hypothalamus gland, it is supposed to help you not be so hungry, making it more possible for you to eat less, have fewer cravings, and eat healthy. How often is Phentermine taken? Normally, taking Phentermine once a day is suggested. There are certain people who may be told by their doctor to take it more often, but usually not. Phentermine is to be taken on an empty stomach and shouldn’t be broken or crushed. It should also not be chewed. Dosage and directions for taking Phentermine should be given to you by your doctor and followed strictly. Are there side effects with Phentermine? Common side effects include blurry vision, sleep problems, digestive and stomach problems, constipation, having a dry mouth, being more irritable than normal, increased heart rate, high blood pressure, depression, tiredness, dizziness, confusion, and many others. There are other potentially serious side effects that may occur, especially if you have any history of depression, drug abuse or dependency, alcohol abuse or dependency, allergies to medications, or are sensitive to Phentermine. Phentermine may also cause a false positive result in a drug test, as it is considered to be very close to an amphetamine in the drug category. Is Phentermine for long term dieting use? No. 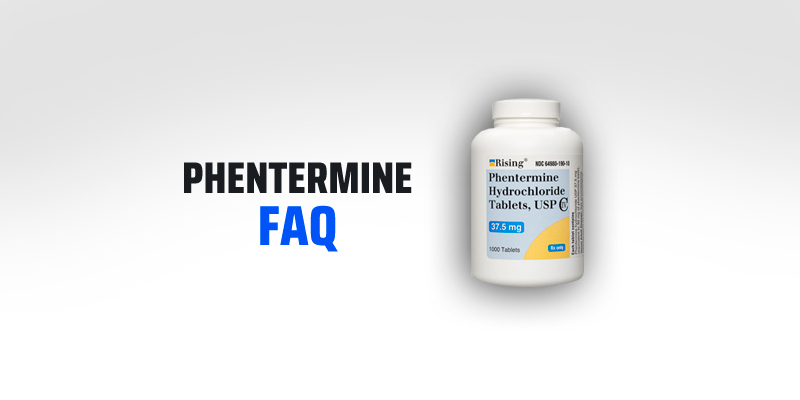 Phentermine has been used only for a short period of time and is potentially harmful if used too long. It has possible addictive qualities and can lead to withdrawal if use is stopped fast and without supervision. When using Phentermine, it is recommended that dietary control be worked on. Modifying behavior and beginning a regular exercise routine are recommended. You should be changing your lifestyle to a healthy one that will enable you to continue losing weight once you have stopped using Phentermine. Do I need a prescription to buy Phentermine? Yes. Phentermine is a controlled substance, so it can only be bought with a doctor’s prescription. If you think you are a good candidate and would benefit from using Phentermine, talk to your doctor. Make sure you tell him or her about any medications you are or have been on. If your family has a history of mental illness, depression, anxiety, or any other conditions that fit into that category, tell your doctor. Can Phentermine be taken with other weight loss products? If you are taking or considering taking other diet products or any medications, you should ask your doctor if they are compatible with Phentermine. Some medications or diet products may interfere with Phentermine, and some may cause more serious side effects when used together. Phentermine has helped many people who have had a weight problem and could have developed weight-related health problems. Maybe it can help you lose weight and keep it off. Talk to your doctor about what Phentermine might be able to do for you and your weight loss efforts.